Having been the coveted backdrop for cinematic and photography shoots, fashion shows, and other high-profile events, Laxmi Niwas Palace offers jaw-dropping interiors and stately exteriors to impress every guests and ensure an inspired and productive event. Various meeting rooms, terraces, lawns, and other indoor and outdoor spaces are available to customize events of all sizes. 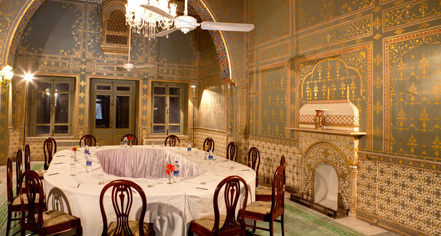 Once the designated room for meetings and semi-formal discussions of Maharajah Ganga Singh, The Gulab Mahal is a resplendent space adorned with marble walls etched in an Usta lotus motif. The tall arched roof of The Gulab Mahal commands over four grand columns, each with a deity carved into the bottom, bestowing insight and direction to success and productivity. 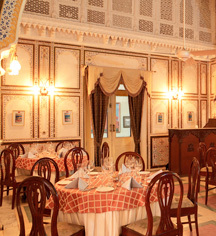 Furnished with an antique baby grand piano and grated fireplace, The Gulab Mahal can accommodate up to 60 guests and has a dining room that can be sectioned off. Originally the royal smoking room, Rajat Mahal has since been converted into a reading room where original friezes feature angels, raginis, and deities hovering over dramatic scenes of weather, paying homage to the region's intense climate. Displaying over 18 kg (40 lbs) of gold, Rajat Mahal is a thoroughly distinguished venue adorned wtih Usta artwork, a red and gold-painted ceiling of teak, a marble fireplace with gold enameling, and grey accents. Rajat Mahal is available for large private events and meetings. Personalized banquet menus, themed activities, and special rates are available for groups and corporate arrangements.